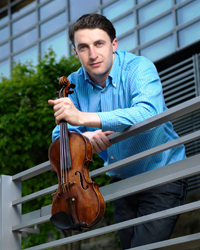 PITTSBURGH—Noah Bendix-Balgley, Pittsburgh Symphony Orchestra (PSO) concertmaster since 2011, will join the Carnegie Mellon University School of Music faculty this fall as an artist lecturer and will coach several student string quartets. A passionate and experienced chamber musician, Bendix-Balgley was the first violinist of the Athlos String Quartet from 2008 until 2011 before joining the PSO. The Athlos Quartet won a special prize at the Felix Mendelssohn-Bartholdy Competition in Berlin and performed throughout Europe. In 2011, he performed on a North American tour with the Miro String Quartet. He has performed with artists including Gidon Kremer, Yuri Bashmet, Gary Hoffman, Lars Vogt, Ralph Kirshbaum, and percussionist Colin Currie, and has appeared at many festivals in Europe and North America, including the Verbier Festival, the Sarasota Festival, ChamberFest Cleveland, and "Chamber Music Connects the World" in Kronberg, Germany. Bendix-Balgley has appeared as a soloist with numerous orchestras in Europe and in the United States, including the Orchestre Philharmonique de Radio France (Théâtre du Châtelet, Paris), the Orchestre National de Belgique (Palais des Beaux-Arts, Brussels), the Cincinnati Symphony Orchestra (USA), Orchestre Royal de Chambre de Wallonie (Belgium), the Orchestra Filarmonica Marchigiana (Italy) and the Asheville Symphony (USA). The Pittsburgh Post-Gazette named his Pittsburgh debut recital in January 2012 the Best Classical Concert of 2012. A laureate of the 2009 Queen Elisabeth Competition in Brussels, he won third prize and a special prize for creativity at the 2008 Long-Thibaud International Competition in Paris. Bendix-Balgley won first prize at the Vibrarte International Music Competition in Paris, and was awarded first prize and a special prize for best Bach interpretation at the 14th International Violin Competition "Andrea Postacchini" in Fermo, Italy. Bendix-Balgley received his bachelor's degree in music with highest distinction from the Indiana University Jacobs School of Music, where he was a student of Professor Mauricio Fuks. He earned his postgraduate Meisterklasse diploma for violin in 2008 from Hochschulefür Musik und Theater Munich, where he studied with Professor Christoph Poppen. Noah Bendix-Balgley (pictured above), Pittsburgh Symphony Orchestra (PSO) concertmaster since 2011, joins the Carnegie Mellon School of Music faculty as an artist lecturer and will coach several student string quartets. Photo by Rob Davidson.